1. Preserve funding for chronic disease prevention programs that were funded since 2010 through the Prevention and Public Health Fund, which probably will not be included in the American Health Care Act. 2. Preserve funding for SNAP-Ed and EFNEP when the Farm Bill is reauthorized later this year. We also provided statistics and participant stories about the successes for SNAP-Ed and EFNEP through Utah State University Extension’s Food $ense program to encourage continued funding for these programs in the Farm Bill. We discussed the impact of the Utah programs currently funded through the Prevention and Public Health Fund (learn more at http://healthyamericans.org/health-issues/wp-content/uploads/2015/01/UT-Fund-at-Work.pdf). Lastly, we encouraged our Congress members to sign the resolution to recognize the 100th anniversary of the Academy of Nutrition and Dietetics. The message that we heard repeatedly from our Congress members’ staff is that they want to ensure local and state agencies have more control and oversight of programs funded by any of these methods, and that chronic disease prevention is a key priority for all of them to reduce overall healthcare costs and disease burden. All seemed supportive of our efforts to maintain access to nutrition services. • Senator Mike Lee wants health care to become more patient-centered, with the patient having more influence over his/her own care decisions. He will continue to advocate for a healthcare bill that respects and provides for this. • Senator Hatch is the co-chair of the Senate Chronic Disease Workgroup, and has co-authored the CHRONIC Act to implement Medicare payment policies to improve management of chronic disease, streamline care coordination, and improve quality outcomes without adding to the deficit. This bill aligns with the Academy’s Public Policy Priority of chronic disease prevention, improving access to health care and working to eliminate of health disparities among racial, ethnic and other disadvantaged groups, so the Academy strongly supports this bill. 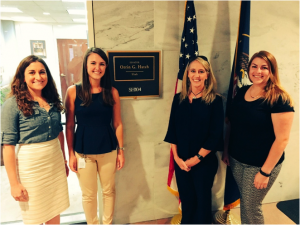 We thanked Senator Hatch and his staff for their work on this important topic. I had been contemplating attending the Academy’s Public Policy Workshop (PPW) for a few years and this year I finally got to go! Once I found out that Wendy Phillips, a PPW pro, was going to be there with me, deciding to attend was an easy choice. I was nervous because I had never attended PPW and I had never met with a legislator or their staff to advocate for anything before. The webinars by the Academy made the preparation process simple and regular emails with tips and links to useful resources complemented the material from the webinars. If you’ve never heard of PPW, each year the Academy holds this workshop to advocate for policy and legislation that aligns with their goals to improve the health and nutrition of the population. In the past, the workshop was primarily held face-to-face, but based on the feedback of members who were unable to attend because they couldn’t take that much time off work, the format has been changed. Now the Academy provides webinars that participants watch before they go to Washington, D.C. and the time in DC is spent making the final plans for meeting with legislators. Each of the webinars helped me prepare for the meetings Wendy and I had with our Congress member’s staff. The first webinar helped expand my understanding of the importance of advocacy for nutrition services. An important message shared by our Academy leadership is that the Academy is a nonpartisan organization. I wasn’t going to be advocating for a specific political party; I was going to advocate for programs that I believe can help people live healthier lives. Another important takeaway message in this webinar is: If dietitians don’t advocate for nutrition services, no one else will. 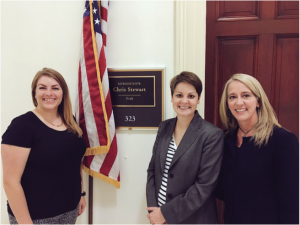 We have a responsibility to our profession to communicate the benefits of nutrition services to our legislators so they can make informed decisions on the legislation presented in Congress. The next webinar helped me realize that I already had compelling stories to share with my Congress member about why funding nutrition services is important. As a dietitian who previously worked in clinical settings, I worked with many patients who benefitted from nutrition services or who would have, if the programs had been available to them. I also learned where to find the data I needed to make my stories even more compelling. After this webinar I was more excited about sharing these stories than I was nervous. Some of those initial feelings of inadequacy receded. The next two webinars thoroughly outlined the two talking points the Academy wanted us to focus on in our visits. I learned about the funding of disease prevention programs and where nutrition education programs fit in the Farm Bill. The last webinar was a final round up of the topics covered in the previous webinars and allowed some PPW veterans the opportunity to share their stories of how they got involved in advocacy. It was inspiring to me to hear those stories because the dietitians who have had great success while advocating are just like me. They go to work each day in their corner of the world, but through advocating for nutrition they have developed positive relationships with their legislators and are recognized by their legislators as experts. Their legislators even contact them when they are reading legislation that may have effects on nutrition programs. Once I arrived in DC, I worked with Wendy to split up responsibilities for our meetings. I felt comfortable talking about the Farm Bill, so we decided that’s what I would talk about during our meetings. I let Wendy take the lead in our meetings, because I was nervous, but by the end of the first meeting I was eager to go to our next meeting. The rest of our meetings went well. Wendy and I took turns sharing stories, developing a rapport with the staff, and allowing the staff to ask us questions about nutrition. Any feelings of inadequacy that I had previously felt were gone by the end of that first meeting and I was wondering why I had been so nervous before. All of our meetings were positive and the staff were interested in what we were sharing with them. I was worried that perhaps some staff would be defensive or ask us tough questions, but their questions were easy to answer and the staff were more than willing to share the specific Congress member’s thoughts on the talking points we had come prepared to discuss. More than once during PPW I heard the following statement: If dietetics is your profession, make policy your passion! I can honestly say that I have more passion for policy than I did before attending PPW. If you have ever considered attending or you’re nervous about your ability to successfully advocate for dietitians and nutrition services, I encourage you to find a mentor and dive in. I have benefitted personally and professionally by participating in advocacy efforts. 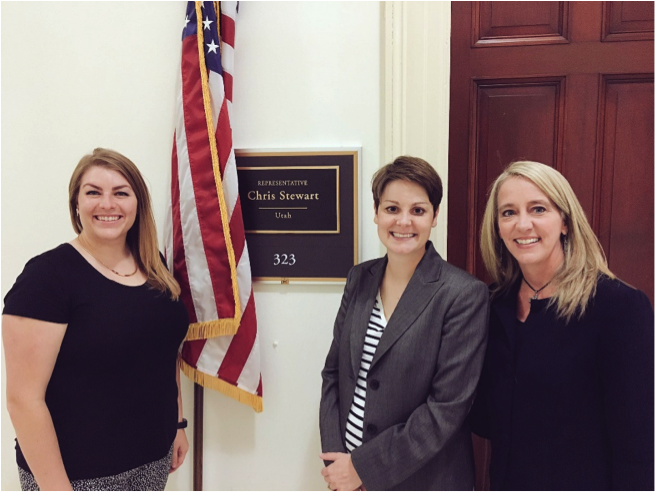 Every dietitian doesn’t need to travel to DC and meet with their Congress member, we can make a difference here in our own state by attending town halls (virtual and in-person), reaching out to our Congress members with personalized letters, and meeting with staff in the district office. Before I attended PPW, I felt unprepared, and maybe even unqualified, to go to DC and advocate for dietitians and nutrition services. Now that I have been, I can’t wait to attend again next year because I have realized that I am qualified and that our Congress members do want to hear from us. I will also work to increase my advocacy efforts while I’m at home here in Utah. You should think about joining me.